I enjoy creating my skateboard art digitally, but nothing beats that feeling of creating something by hand. This deck is a mixed media piece of sorts - acrylic paint, sharpie marker and spray paint. 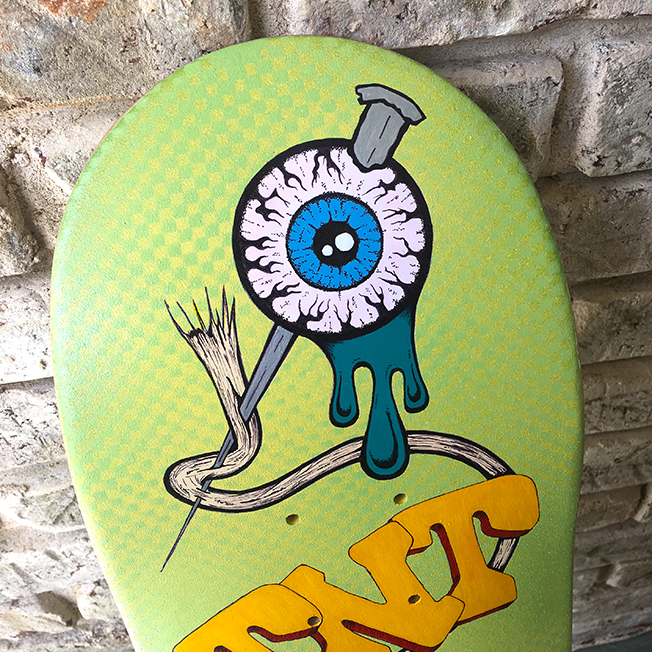 I made this deck for the local Hand Eye Exhibition that was sponsored by Ruin Skateshop in Dunwoody, Ga. The show was an exhibition of hand made skateboard art. All the proceeds went to purchasing socks for the Metro Atlanta homeless. 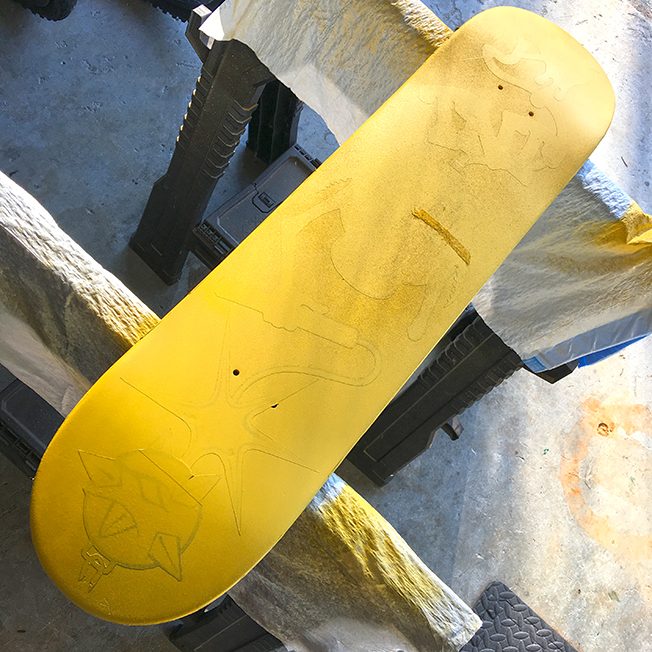 Below are shots of the skateboard deck I took throughout the process accompanied by a brief explanation of each stage of the board. 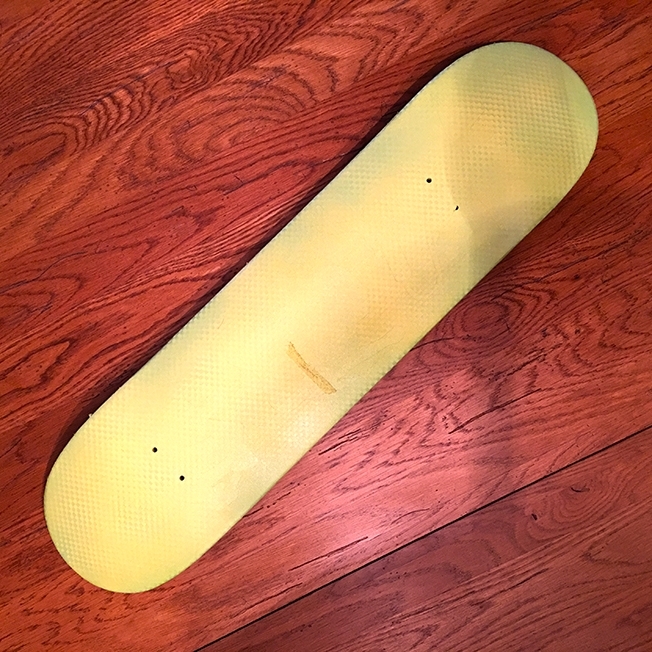 Straight from the Ruin Skateshop—this is the unpainted deck in all its naked glory. I got right to work sanding down the board with a fine grid sandpaper to prepare it for primer. After I sanded it, I wiped it down with a damp cloth and waited for it to dry. When the board was completely dry I wiped it down with a tack cloth to remove loose particles of dust, dirt and lint. Then sprayed it with 3 coats of Rust-Oleum's, 2X Ultra Cover Flat White Primer. I waited 10 minutes between each coat. I didn't draw directly on the board for this one. I sketched everything out individually first, and then transferred the drawings to the board. I used a real simple process. After I sketched out all my artwork on paper, I rubbed the back of the paper with a 7B pencil, taped the artwork into position on the board, and drew over the lines. This transfers the art to the board and then it's ready to be inked. 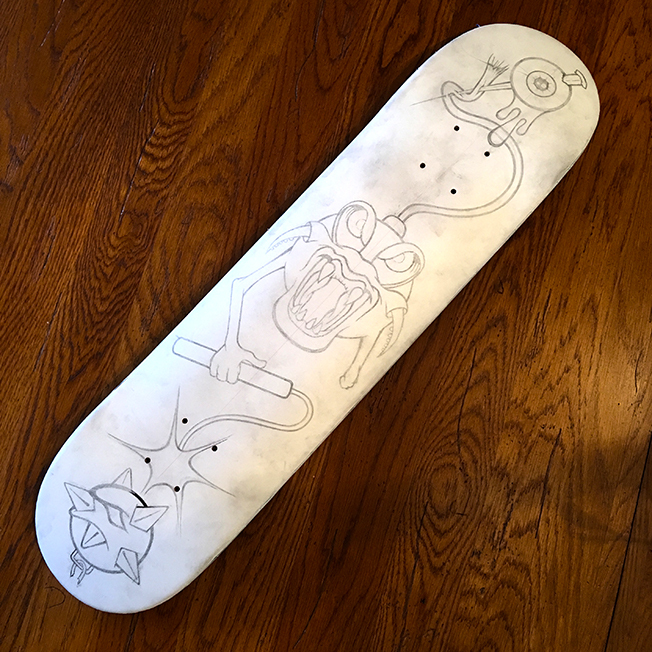 The next step was to ink the skateboard. The last bit in this photo that needed to be inked was the TNT lettering. I inked all the artwork with an ultra fine point Sharpie. I sprayed 3 coats of a Rust-Oleum yellow, waiting 10 minutes between each coat. 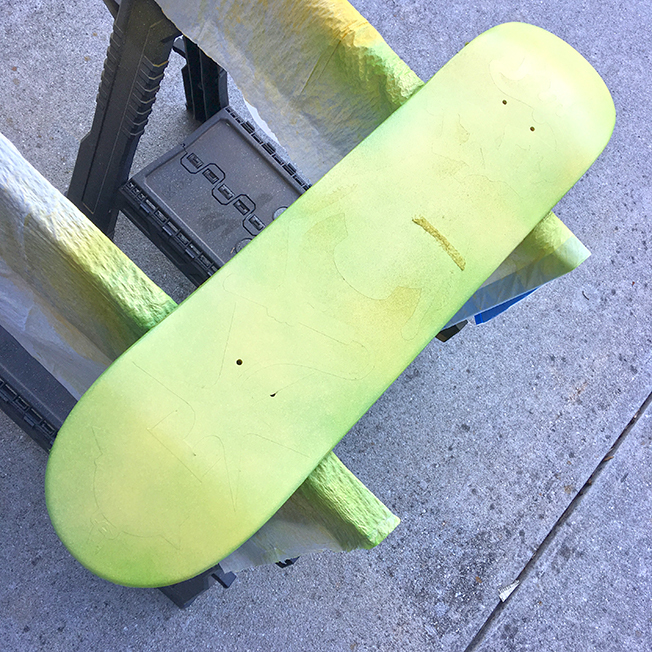 I didn't want a gloss paint because I knew I was going to spray the finished skateboard with a high gloss clear. All the spray paint I used for the background was a satin finish. A satin finish is so beautiful, I could have left it the way it was, but I wanted a clear coat to protect the board, plus I knew the gloss of the clear was going to look great. I waited 24 hours for the yellow to dry. Then I came back in with a nice, light, apple green and misted it over the yellow. I didn't completely cover the yellow so there's a cool "airbrush" affect to it. You have to have a lot of self control at this stage so the yellow still comes through. And if you're going to do something like this, pick colors that blend together. The green spray paint was also a Rust-Oleum satin finish paint. I waited 24 hours for the apple green to completely dry. Then, for the background pattern I sprayed the board again with a darker green. Again, I misted the board for an "airbrush" affect. I couldn't find another shade of green from Rust-Oleum that I liked, and that was a satin finish, so for this I used a satin spray paint from Valspar. I know you walk a razors edge when you mix different brands of paint because you don't know how they're going to react to the clear coat, but if you don't try different things you'll never know what works and what doesn't. I don't want to over simplify this final stage. It obviously took the longest time to complete. After I finished spray painting the background I painted the board with acrylic paint. And, I'll let you in on a little secret. I also used Testors acrylic model paint to get a great metallic shine for the spikes on the flail at the bottom and the one going through the eye at the top. After I completed the painting I sprayed the entire board with 3 coats of Krylon Colormaster gloss crystal clear. Again, waiting 10 minutes between each coat. 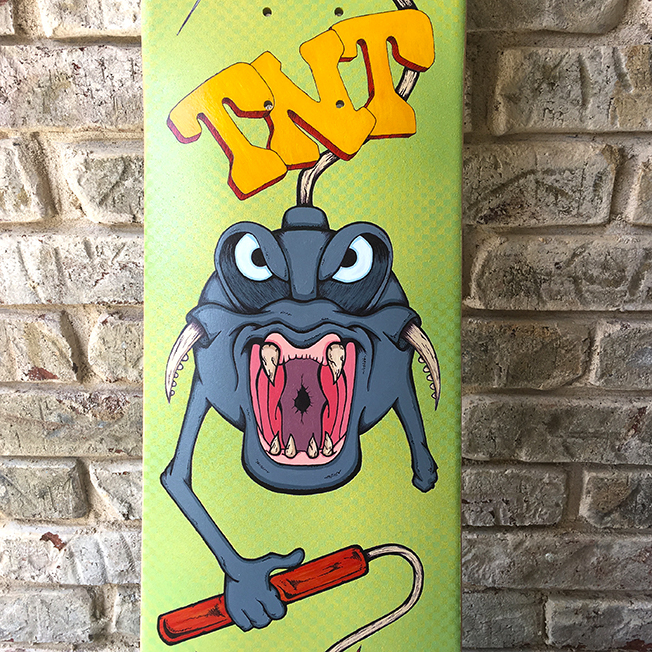 I hope you enjoyed reading about how I created my Mad Bomber skateboard deck. I sure as hell enjoyed making it. If you have any questions about this or anything else you see on my site, drop me a line. I'll definitely get back to you. Thanks for the support!